Dangote Petrochemicals and Refining Company said it would save Nigeria $7.5 billion annually when its ongoing projects are completed in first quarter of 2019. Speaking to journalists at the weekend during an onsite facility tour of the projects situated at Lekki Free Trade Zone, Lagos, the President of Dangote Group, Alhaji Aliko Dangote, explained that 'the money would be earn from import substitution. Import substitution means that what you will realize earnings from those goods you can produce here instead of importing them. $5.5 billion is used to import aviation fuel, diesel, kerosene, poly ethane etc. When we export these products, we get forex and we will stop importing all these products. Furthermore, Dangote said he is committed to the multi-billion dollar project to help diversify the nation's economy. Urging government to sincerely pursue the diversification of the economy, he said that projects such as these are needed to wean Nigeria from relying solely on oil as well as optimise government revenue. 'The best way of diversification for Nigeria was agriculture and our fertilizer plant is in line with that goal. By the time we finish out gas pipeline, it can generate about 12,000MW and we can export to other African countries. 'We would have the capacity to store four billion litres of products, and can load 2,680 trucks per day,' he said. Dangote noted that the project would crash the price of Premium Motor Spirit (PMS) because the product is refined in-country, and will therefore save some costs incurred in the import market. 'We are putting in 65 million cubic meters of sand and that was why we brought in three dredgers, two of which are the biggest in the world. This place is eight times the size of Victoria Island,' he said. On allegations of conflict with the host community, he said there are no issues, noting that the past issues were between two communities and the state government. 'We did not buy the land from communities, we bought our land (swamp) at $100 million and the filling up the swamp to become solid land is costing us another $420 million. 'The petrochemical plant is 13 times bigger than that of Eleme petrochemical. It is 10 times the size of Nafcon and therefore the largest fertiliser plant in Africa,' he said. 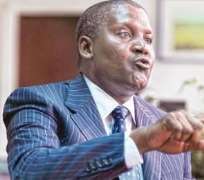 He said the holding company, Dangote Industries Limited, which is different from Dangote Refinery, took an initial loan for the project that has accrued an interest of $173 million, stressing that, contrary to speculations, the company has not gotten substantial forex from the Central Bank of Nigeria (CBN). The Group Executive Director, Dangote Group, Devakumar Edwin, said the plant's basic engineering is currently at 98 per cent completion while the construction is 10 per cent in progress. He estimated that the project would aid the country with about $7.5 billion forex savings on import substitution; generate $5 billion forex earnings from savings and another $5.5 billion export earnings. The plant, according to him, will generate over 100,000 employment opportunities and revive over 11,000 filling stations that have been shut down due to shortage of products. He said the project was designed to process largely variety of crudes including all African crudes, a range of Middle Eastern crudes and U.S crudes. Earlier during the visit, the Vice President Femi Osinbajo had stated that by the first quarter of 2019, the nation's refining capacity would be sufficient for the domestic market and export. Osinbajo was optimistic that the project would also boost gas supply to power plants through the three billion standard cubic feet (scuf) per day gas pipeline. 'The facility would buoy export earnings after meeting the nation's current requirement of two billion scuf per day. The gas pipeline, slated for commissioning in 2018, would take off from Bonny through Ogedegbe to Olokola and onward to Lekki,' he said. He added that the line would hook up with Escravos-Lagos pipeline and the West African Gas Pipeline. 'The project is an incredible industrial undertaking and possibly the largest investment ambitious in the continent today. I think it is inspiring. 'The refinery would start production in the first quarter of 2019. The subsea gas pipeline, which is an important and strategic project is meant to take off in 2018,' he said.